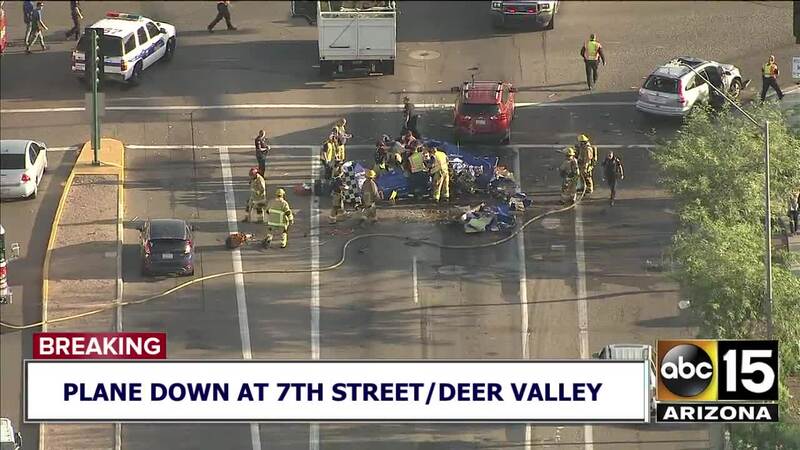 A plane has crashed in the roadway near 7th Street and Deer Valley Road. Officials are investigating a deadly plane crash near 7th Street and Deer Valley Road on Monday morning. The FAA says the aircraft involved is a single-engine, home-built Acroduster. It reportedly crashed in the intersection around 6:50 a.m. under unknown circumstances. One person was killed and another was injured, according to Phoenix aviation officials. Phoenix Fire says they took the surviving victim, a man, to the hospital in critical condition. Video from the scene showed emergency crews working around debris in the roadway near several damaged cars. Police told media on scene the vehicles had substantial damage but no one on the ground was hurt. The area is shut down to drivers and there is no estimated time to reopen. Check current traffic conditions here.